We are providing Soil Treatment Services for all Commercial and Industrial spaces. - Soil can be treated against certain pests like termites, centipedes, millipedes and others. - (ii) Dig shovel-width trenchesalong the external wall of the building exposing the foundation wall surgace. - (iii) Treat the back fill earth with chemical emulsion. Indian Pest Control & Fumigation Co.
Pioneer Agritech Solution Pvt. 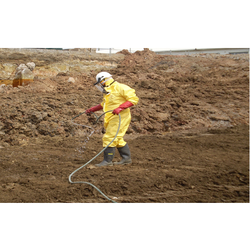 Ltd.
REEL provides a full range of site remediation and contaminated soil treatment services. Eradication and prevention of termite infestation in already constructed buildings. Pesticide with long residual action is injected through drill-holes made at infested areas of the building. This is helpful for better root growth, improving soil properties, betterment in water holding capacity, better soil-water-air relationship and overall plant growth and also has insecticidal effects to the roots. Engaged in providing Services such as Pre or Post Construction anti-termite soil treatment service. Soil treating consists of applying termiticides to the soil under and adjacent to a building to create an impervious chemical barrier. Service Description: Being a leading enterprise of this industry, we are offering a huge range of Soil Fertigation Service. Soil treatment should start when foundation trenches and ready to take mass concrete in foundation. Lying of mass concrete should start when the chemical emulsion has been absorbed by the soil.